Lisa Bauer grew up on a farm in Styria near the border triangle Austria-Hungary-Slovenia. Not far away, at the college in Silberberg, she studied fruit and viticulture. A classic way, her parents run a tavern. But at the same time she is at home in the wide world: she gained work experience in Germany, Switzerland, Mallorca, Chile and Argentina, Lisa speaks fluent Spanish. Her journey also inspired the idea for DeVin, a series of exceptional spirits: a filigree bitter, a gin called Señora Eva, the wild fruit liqueur Red Corazon, a playful muscat-based vermouth. And that’s just the beginning! 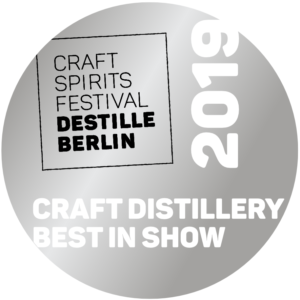 – DESTILLE BERLIN awards Lisa Bauer the title “Best Female Craft Distiller 2019”. A life for the distillery: Philipp Schwarz studied beverage technology at the university in Geisenheim, then he became manager of the research and teaching distillery at the equally renowned university in Hohenheim. The next station was the Hessische Spezialitätenbrennerei Behlen, now he is the distillery manager of the malting specialist Weyermann in Bamberg. But that’s not all: Philipp Schwarz works as a sensory expert, lecturer at the Versuchs- und Lehranstalt (VLB) in Berlin, writes for the magazine “Kleinbrennerei” and is the author of textbooks on “The 100 Best Fruit Varieties for the distillery “or about” starchy raw materials in the distillery “. A life for the distillery – just 29 years old Philipp Schwarz! DESTILLE BERLIN awards Philipp Schwarz the title “Best Young Craft Distiller 2019”. Behind the unadorned facade of an industrial building on the outskirts of Copenhagen, a new world opens up: Empirical Spirits; The distillery looks like a chemistry lab, lots of glass, lots of stainless steel. The distillery was founded by chef Lars Williams and his partner Mark Emil Hermansen, both previously employed at Noma, named “the best restaurant in the world”. Her motivation: to create flavors that were previously unknown. Do not make the good better, but develop something new. Their approach is scientific, driven by curiosity and courage, their products are daring. For example a spirit made from habanero vinegar sauce; not spicy, but floral-fruity. Or a roasted juniper berries liquor. Or “Helena”, a product that combines Eastern and Western fermentation techniques. With their enthusiasm, their creativity and the certainty that everything is possible, they enrich the field of craft distilling enormously. – DESTILLE BERLIN awards Empirical Spirits the title “Outstanding Innovation 2019”. You are traveling through the Mostviertel in lower Austria, on a meadow a man with a stainless steel barrels crosses your path? It should be Georg Hiebl of the Destillerie Hiebl. Herbs are losing their aromas shortly after harvest, the time between picking and maceration is crucial. So Georg brings the neutral alcohol directly to the field and starts extracting there already! – Georg Hiebl is obsessed with distilling, quality and the idea of bringing flavors in a highly concentrated form into a bottle. Of course, this includes stone fruit, pome and berry fruit, but also spirits of tarragon, sage and rosemary or carrot and pumpkin eau-de-vie or distillates of quinoa and amaranth. The distillery developed from a peasant economy. In 1996, the 150-liter pot still was operated for the first time. That’s not long ago. But with his creative approach, he breathed new life into the tradition of fruit brandy and the self-understanding of the craft distilling. 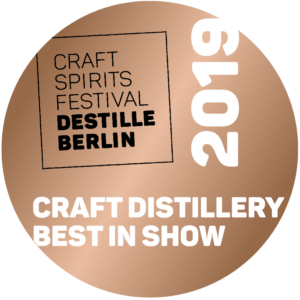 – DESTILLE BERLIN awards the distillery Georg Hiebl the title “Best in Tradition 2019”. Who likes fancy cocktails and an acrobatic show of a bartender is here in the wrong place. Anyone who thinks of mixing industrial spirits is already “craftmanship”, as well. If you’re looking for genuine, authentic distillates, then Beavis Bar in Berlin-Mitte is the place for you. Jon Cooper and Rik Lusing opened their “Craft Spirits Tasting Bar” in 2018, here are craft spirits the main characters. Well over 700 products from A like Amaro to Z like Zibärtle always from small producers, all made from natural ingredients. Many of their suppliers know Jon and Rik personally. Craft spirits are usually served to their guests in tasting flights, with water and small bites of bread, cheese and sausage. This is a library, an archive, an Eldorado for friends of artisanal spirits. – DESTILLE BERLIN awards Beavis Bar the title “Farm-to-Shaker Bar 2019”. Bright room, bare wooden tables, industrial lights from the ceiling: this does not look like a classic bar, and it is not. “Wagner” in Berlin-Kreuzberg offers the combination of excellent food and excellent drinks. It calls itself a “Cocktail Bistro”. Bartender Tuan Anh Nguyen accompanies the Nordic inspired craft kitchen adequately. Tuans Place is behind the long counter, very close to his impressive selection of artisanal spirits, always within reach of his collection of historic cocktail books. In the first half of the evening he composes the liquid pleasures for food pairing, in the second half he takes over the helm. In a casual, charming way, he manages to serve cocktails and unobtrusively shares his extensive knowledge about liquor. Who leaves the Wagner after midnight, is a whole lot smarter in terms of craft spirits. – DESTILLE BERLIN awards Tuan Anh Nguyen the title “Farm-to-Shaker Bartender 2019”.